THE LITTLE RED RIDING HOOD AND THE LITTLE CARETTA-CARETTA Once upon a time a Little Red Riding Hood was living in Greece and, especially, on the beautiful island of Zakynthos in Keri, in Koumaria hill. There was no bad wolf, only hunters, boatmen and guards!!!! One day her mother called her and gave her a basket with local food to give it to her father, in Marathonisi, who was working as a guard in the National Marine Park of Zakynthos. Marathonisi is a small island in Lagana bay. Caretta-caretta visits the island, besides tourists, and lays its eggs from May to October,. Every day her father would go and look after the nests and inform the tourists about them . That day her mother gave her some advice about the sun and the sea. The Little Red Riding Hood liked going there very much . She was wearing her red bathing costume and was diving to the blue waters of Marathonisi. She had never seen a little caretta-caretta before, as it was forbidden to stay on the island after the sunset. When she grew up she wanted to be a guard in the National Marine Park too. Her father was so lucky!!! 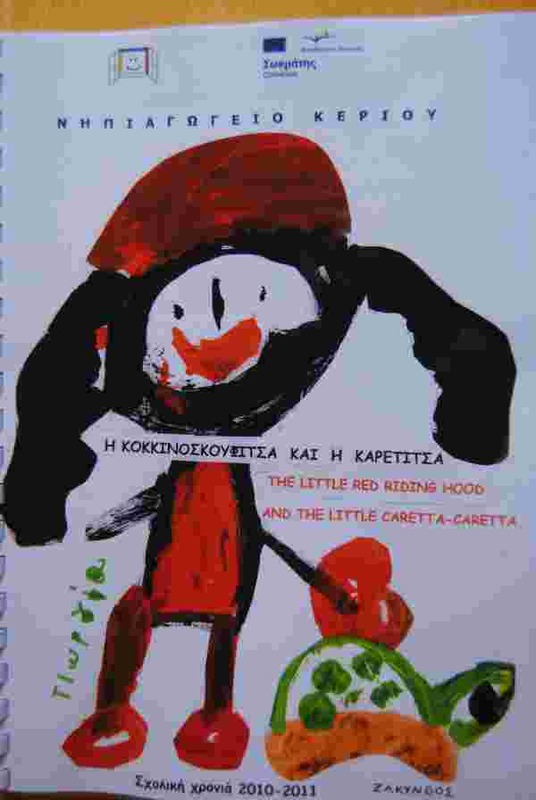 The Little Red Riding Hood went to the Lake of Keri, she took the first boat to Marathonisi and, instead of going there, she went to the caves. She was in Myzithres.!!! There, into a small cave, between the two Myzithres, she saw a seal with its baby and she realised that she had taken the wrong boat. The boat was full of tourists who were taking photos. So she couldn’t go back very quickly. She had to wait. Her father would worry very much. Fortunately, a seagull , which was flying with other ones behind the boat, saw her. It knew her very well, as the Little Red Riding Hood and her classmates were collecting litters from the beach. It was the seagull of Junior Helmepa!! It took her to its wings and they went to Marathonisi. Marathonisi looked like a huge caretta-caretta too!!! WOOOOOOOW!!!!!! When she arrived, she thanked the seagull and she promised to keep cleaning the beach! She gave the basket with the food to her father and she explained him what had happened!! She dived into the blue waters, waiting for the next boat!! Finally, here in Zakynthos they all lived happily ever after….